The days of confusing alphanumeric version markers are over. WiFi Alliance, the global consortium that sets wireless standards, is ditching its traditional naming convention for Wifi versions. For most people, this is a much welcome change. Maybe even an overdue one. Sorting through WiFi specs has always been kind of a pain. The changing letters tacked onto the familiar “802.11” can be hard to figure out. Keeping them straight can be a challenge — even for IT pros. If you’ve ever taken Network+, you know the pain. For average users, they can seem like complete gibberish. Fortunately, the days of needing to understand n, g, b, and ac are over. The new standard involves just a “WiFi” and a number now. That’s it, really. 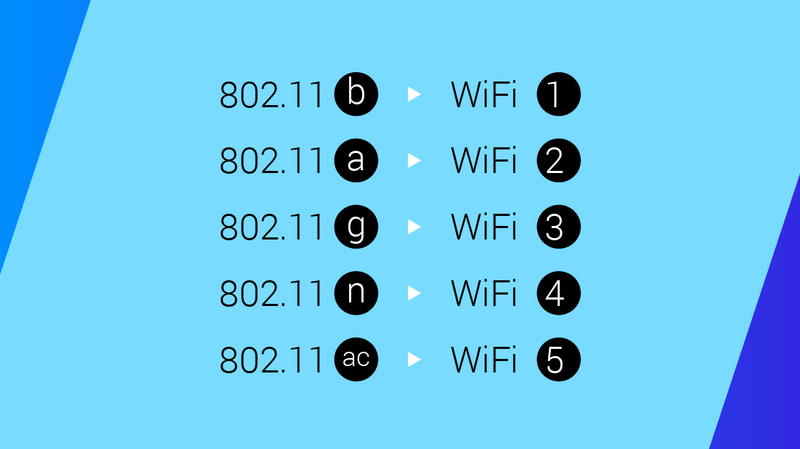 Let’s take a closer look at the new, more simple WiFi numbers. Previously, wireless version information used a certain formula based on IEEE 802 standards for data transmission. The 802 represents just that: the movement of data. Additional numbers specify how data is traveling. It’s the “.11” in 802.11 that means wireless. Other forms of transmission have their own numbers. For example, Ethernet is 802.3 and 802.15.1 was allocated for Bluetooth. Letters were added to the core of 802.11 to keep track of ever-evolving wireless specs. Since 802.11a was established in 1999, versions have run through most of the alphabet and back again. The problem is that letters aren’t intuitive. Where conventions often use letters that represent something easy to remember (like “n” for network, “c” for cloud, “i” for internet), WiFi letters don’t. There’s no way to guess what letters mean without delving into the specs. This might not be a problem if wireless were an obscure or little-used technology. But almost everything is wireless these days — or working toward it. From phones and PCs, to cars and kitchen appliances, 802.11 is getting a lot of action these days. And this complicated system of keeping track of versions creates a lot of headaches for a lot of people. So the WiFi Alliance is simplifying the system. Instead of names like 802.11b, 802.11g or 802.11ac, there’s a new convention of “WiFi 4,” “WiFi 5” and “WiFi 6,” respectively. And presumably 7, 8, 9 and so on — as time goes on. The new standard will make it a lot easier to determine both current and backward compatibility. Honestly, it doesn’t get much more straightforward than that. If you’re working with older a, b, or g standards — which fall under WiFi 3 or earlier versions — you might want to consider making upgrades. Just saying. Even though it makes a lot of sense, this transition might be difficult at first. People get used to standards, even when they’re tough to understand. We’re creatures of habit. After years of seeing alphanumeric signifiers, it could be confusing to be confronted with numbers. It may even make some folks suspicious. Tech stuff, let alone, wireless standards, can be hard for the average person to understand. The phrase “user-friendly” is often difficult to utter without irony (or even bitterness). Not everyone is going to believe that this is as simple as it sounds. As a result, IT professionals could play a key role in soothing any end user anxieties through this transition. How will the new numbers be adopted? Even the best system is only effective when it’s implemented in all corners. At this point, a directive issued by the WiFi Alliance doesn’t equate to marketwide adoption of the new standard. They may be an authoritative source, but the WiFi Alliance doesn’t have any powers of enforcement. That means that tech vendors can ignore this change and continue to use outdated terminology. What if any big players reject the new standards? For example, what if the next iPhone promotes 802.11ax instead of WiFi 6? It’s going to be an uphill battle for all. Basically, organizations must drive the adoption of this new naming standard. But the good news is industry giant Netgear is already onboard. This is leading to a collective hope that more major vendors and developers will buy into the new WiFi version number standards. WiFi’s popularity as a method of transmission makes it a highly competitive field. Not only do your colleagues have to deal with wireless compatibility issues, but also your family and friends. Even your grandmother. Non-IT folks are just as much of wireless consumers — and they like simplicity and ease of use. The wireless industry and its needs are changing, becoming increasingly focused on user experience. Simplifying naming conventions is a great step toward doing just that. Consumers are going to appreciate it, make no mistake. We hope, sooner rather than later. Welcome, WiFi 6! This Week: WiFi 6 is Here! Can BI Services Replace BI Pros?